You know what they say: three seahorses are better than one. Fine, I give in: a tiki cocktail. They’ve been everywhere you turn this summer, flamboyantly garnished and dangerously candy-like, often embarrassing to order—unless you go all out. And at Chicago’s Three Dots and a Dash, they go all out. I plan on drinking a rum punch out of a hollow pineapple at the West Indian Day parade this weekend, and even that vessel is subtle as a Solo cup in comparison to the carefully carved Fijian mermaids (which look more like creepy skeletons) totem-pole faces, and straight-up giant clam shells that are so popular at Three Dots that they’re now for sale on their site. Don’t forget an octopus swizzle stick. They’ll fit right in with your reclaimed wine-bottle tumblers from West Elm! 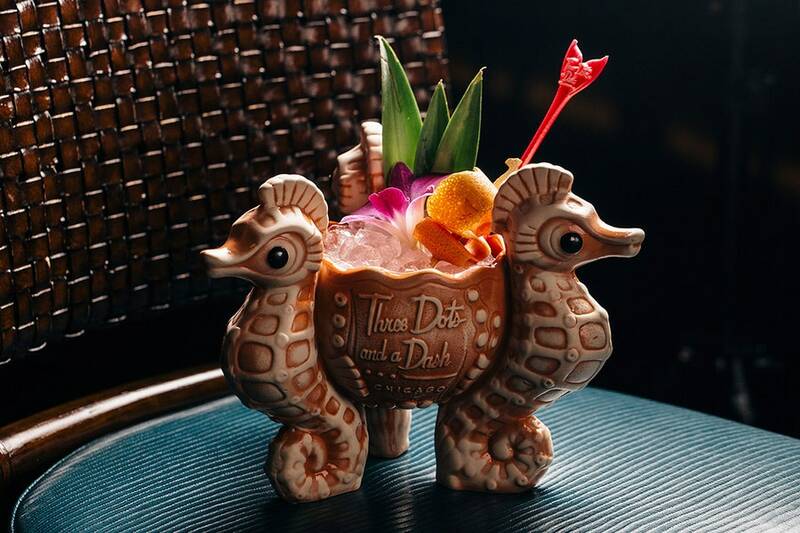 So we’re saying sayonara to summer with the Aku Aku Lapu: starring grapefruit, lemon, pineapple juice, rum, and a splash of mezcal, served in a seahorse-surrounded bowl. Just close your eyes, imagine you’re wearing a seashell bra, combing your hair with a fork, singing among your crustacean friends—life is pretty good. In a buzzing tin, mix the liquid ingredients with crushed ice; buzz 10 seconds. (Alternatively, shake ingredients together in a cocktail shaker until chilled, about 10 seconds.) Strain into a large tiki mug over more crushed ice. Garnish with a grapefruit peel, pineapple leaves, and fresh orchids.